Varenna hotels blend in remarkably with Varenna’s pleasant and rustic Lake Como sorroundings and tend to be much quieter than those in frenzied Bellagio. There are usually not enough Varenna hotels for the amount of tourists present, and unsuccessful tourists usually have to spend the night in nearby Bellano…You are advised to book months in advance for the summer season. The town center is located quite a distance from the train station (20-30 minute walk) so it is best to take a cab to your hotel. In general, getting anywhere in Varenna requires walking up/down stairs and hilly terrain. Now you can do a search to compare the rates of all Varenna hotels by choosing your preferred dates from the search box below OR you can browse through all the hotels listed below. 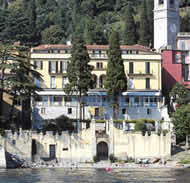 Location: Right on the lake on a small hill, with a 10-15 walk to the Varenna town center and ferry terminal. Description: Set in a 17th century villa with a stunning garden which is terraced down to the lake edge. Very basic rooms but stellar service. Be sure to ask for a lake-view room when booking. Location: 10 minute walk to Varenna’s town center and to the lake. 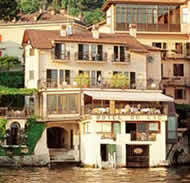 Description: Great for those who enjoy “old-fashioned” decor from Lake Como hotels. Very basic, plain rooms with lake view have tiny balconies unless you upgrade. Beautiful garden with swimming pool also has a lake view. 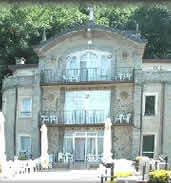 Location: Directly overlooking the lake halfway up the mountainside and a 10 minute walk uphill from Varenna town center. Description: Access via a funicular lift. Built over an old monastery, all the modern, spacious rooms have a lake view. Excellent value for the money! Location: A bit of of a hike up from the lake. Description: The hotel places tourists in nearby apartments (Cassa Rossa) when it gets overbooked. Rooms are small and cozy but have balconies with splendid views of the lake. No Online Booking Available. Call +39 0341 830298 to check rates/availability. Location: Facing the lake and close to Varenna’s town square. 10-15 minute walk to the train station and ferry terminal. Description: Heavenly location. Clean and stylish rooms each named after a flower. Be sure to grab a lake-view room to enjoy the sound of gently crashing waves. No Online Booking Available. Call +39 0341 830238 to check rates/availability. Here is a list of 1 star Varenna hotels for budget travelers if all you are looking for is a basic room to spend the night in for the cheapest price possible. You can always use our maps to map out the address of each Lake Como hotel.